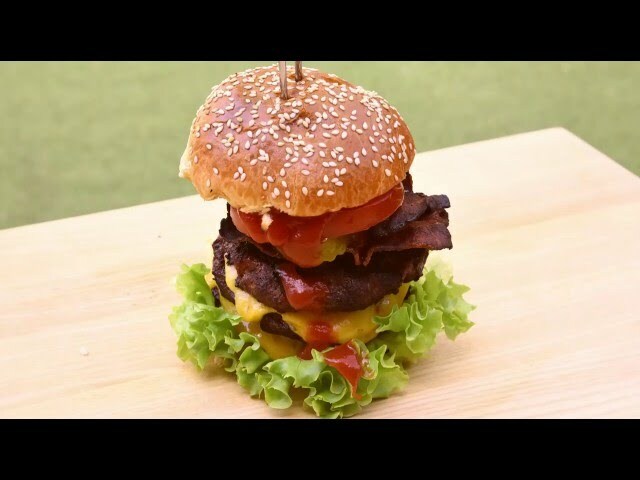 The Ultimate BurgerHow to really create the ultimate burger! Let’s get one thing straight – those who prefer soggy fast-food burgers need not apply! This is the real deal – proper BBQ food at its finest with no fuss, no messing about and no unnecessary ingredients. You can forget about all those barbecue recipes for burgers with a thousand components in the patty alone. With some good quality beef mince, a touch of seasoning and the classic garnishes you know and love, this is guaranteed to make it into your collection of best BBQ ideas on Earth! In a mixing bowl, combine the beef mince with a pinch of salt, a sprinkle of black pepper and a few chopped parsley leaves. Ensure everything is fully combined. Roll the mixture into balls, then flatten out into patties using a burger press. Place the patties on a hot grill, alongside a few slices of steaky bacon. Turn everything as required to avoid sticking or burning. During the final minute, add a generous layer of cheddar cheese to the burgers and allow to melt. When almost cooked, lightly toast a brioche bun on the barbecue. Add mayonnaise and lettuce to the bottom half of the bun. Place one or more burgers on top, followed by grilled bacon, slices of pickled gherkins, tomatoes and onions, followed by a dollop of ketchup and the top of the bun. Hold it all together with a long BBQ skewer and enjoy!